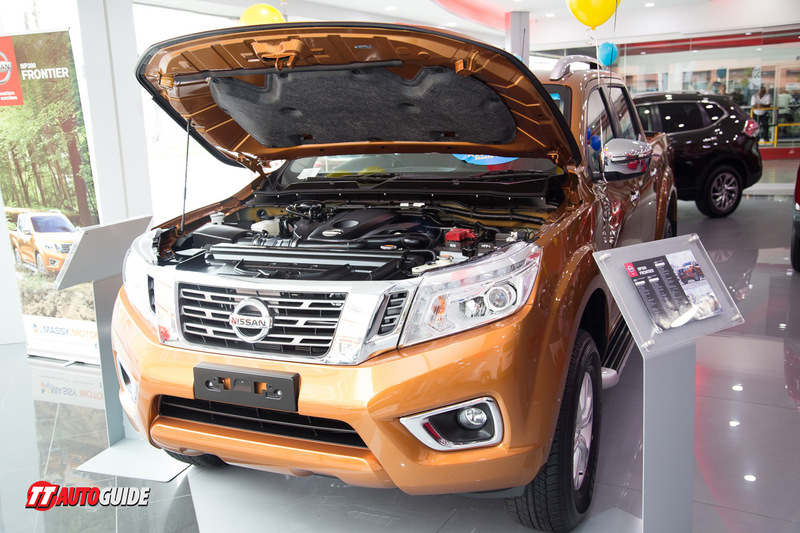 Nissan has updated one of its best selling vehicles in Trinidad and Tobago and while the name may have changed, some things such as build quality and performance have stayed the same. Join us for a feature overview of the 2016 Nissan NP300 Frontier 4×4 XE with Nissan sales representative Mark Nottingham. The new interior of the Nissan NP300 Frontier is spacious and comfortable, offering ample leg and head room for front and rear passengers. Our XE model was fitted with fabric front and rear seats, leather wrapped steering with audio and cruise control, rear AC vents and 5″ LCD infotainment system with integrated revise camera. On the outside, while the new Frontier may be slightly smaller than the Navara as far as dimensions and tray space go, the new Frontier has made up for this in the design department with its muscular stance and chrome accents. Our 4×4 XE came with the factory wide body fender flares, side steps, painted front bumpers, rear chrome bumpers, 16″ alloy wheels with 255/70R16 tires and fog lamps. Nissan is bridging the gap between pickup and crossover even more with the 2016 Nissan NP300 Frontier by improving ride quality and performance. To accomplish this, Nissan installed double wishbone front suspension and five link independent rear suspension with coil springs that make the pickup drive more like a crossover. Power comes from a 2.5L turbocharged and intercooler common rail diesel four-cylinder engine producing 163hp and 403nm-tq and is matched to either a 7 speed automatic or optional 6 speed manual. Drive train options are either 2wd, or the 4×4 models which are fitted with 2wd high, 4×4 low and 4×4 high range. In all there are six different Nissan NP300 Frontier models to choose from – 4×2 Dual-Cab S with 6 speed manual, 4×2 Dual-Cab SE with 6 speed manual, 4×2 Dual-Cab SE with 7 speed automatic, 4×4 Dual-Cab SE with 6 speed manual, 4×4 Dual-Cab XE with 7 speed automatic and 4×4 Dual-Cab XE with 7 speed automatic and leather interior. Safety features included front driver and passenger air bags with seatbelt pretensions and load limiters. Nissan’s ABS, brake assist and EBD help keep you on the road in slippery situations while Nissan intelligent 4×4 systems keeps things in check when off-road. Long gone are the days when a pickup was simply used to carry cargo, now they must multi-task as the family grocery getter, daily work horse and weekend warrior. The pickup segment which was once the domain of farmers and contractors, is now shared with families and business professionals and the Nissan NP300 Frontier is certainly up to the task. This entry was posted in Latest news, News, Vehicle Reviews and tagged 4x4, Frontier, Massy Motors, Nissan, NP300.